These fans generate their own electricity using the heat from a stove. The fan acts like a large heat sink, drawing heat from the stove up through the aluminium base. Half way up the base is a peltier cooler. The temperature difference between the bottom and top of the base causes the peltier cooler to produce low voltage electricity. This powers the electric fan which blows warm air around the room. Suitable for an aga or wood/oil burning stove. What are the advantages of using it? Stoves are good a radiating the heat, but can sometimes leave parts of the room cold while, closer to the stove is lovely and warm. You may find yourself sitting closer to the stove just to keep warm. The ecofan helps to reduce this problem by blowing warm air around the room. 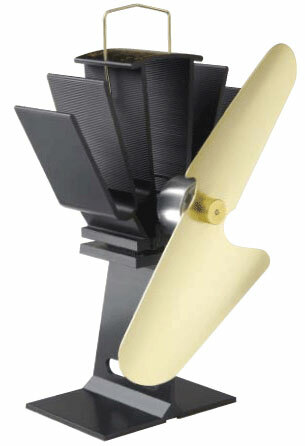 The ecofan is a best seller in narrow boats where one end of the boat can be hot (by the stove) and the other end cold. Note: The fan will run slowly on a hot radiator or on top of a hot cup of tea/coffee, which makes it ideal for class room demonstrations. The peltier cooler in this fan uses the Peltier-Seebeck effect. In 1821, Thomas Johann Seebeck discovered that a solid metal bar that had a large temperature difference between the two ends produced an electric current. In 1834 Jean Peltier took this discovery further by observing that two different metals or semiconductors that are connected in a particular way (Peltier junctions) could act as a heat pump if electricity was passed cross them. In other words heat would be pumped from one side to the other, creating one cool side and one hot side. Peltier coolers are often called thermo-electric coolers (TEC).